Acuvue Oasys 1-Day with HydraLuxe are the latest addition to the Acuvue Oasys range, created by renowned manufacturers Johnson & Johnson. These daily contact lenses offer advanced technology for wearers to experience all-day comfort, vision and handling. These daily disposables are designed to tackle dry and tired eyes, through their exclusive HydraLuxe™ technology. They work with your natural tear film to provide long-lasting performance and to keep up with the demands of your day. 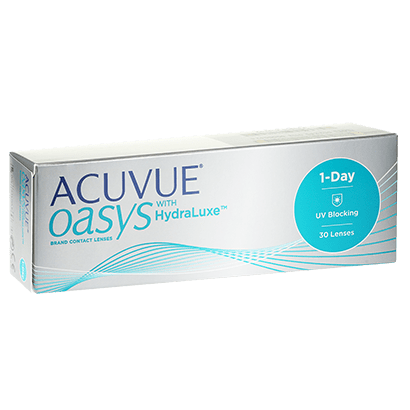 Made with a highly breathable silicone hydrogel material, Acuvue Oasys One Day with HydraLuxe contact lenses deliver excellent moisture retention, for longer-lasting hydration and comfort. Made for effortless blinking and providing full coverage, the lens diameter has been increased to 14.3mm to help cover larger pupils in low lighting conditions. They also have a visibility tint and a handy 123 indicator for easy application. Acuvue Oasys 1-Day with HydraLuxe lenses assure the highest level of protection from harmful sunrays, blocking 99% UVB and 90% UVA rays. On top of that, Acuvue Oasys HydraLuxe require no cleaning or storage, and can simply be worn daily and thrown away for a fresh new pair the next day. Really comfortable and doesn’t dry my eyes out too much. I can wear them for 12 hours without any problems. These lenses are the best for eyes that get dry due to age, environment or medication. I have worn contact lenses for over 40 years and am still able to do so due to these lenses. The most comfortable lenses for me. Great prices & really quick delivery. Good quality lenses. I think they are quite expensive compared to other daily lenses but they suit me, as they are probably the most comfortable lens I have tried. 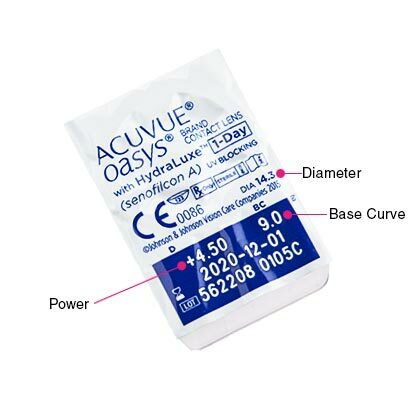 Fantastic lenses for dry eyes, use with Systane vials. Used for 3 months now and not one day of tired eyes. Expensive, but worth every penny to have all day comfort. Only lenses I have had in 5 years that I can’t tell are in. Very good price and service from FGC. Exactly as advertised. Arrived on time and very well packaged. No problems. Recommended by my optician, have been using for some years and not encountered any problems. Really good daily lenses. Don''t make my eyes feel dry at all, even if I have them in all day. Definitely my favourite dailies! One of the best contacts in the market. Very comfortable and moist. Comfortable, do not get dry easily. Seem a little thicker than the brand I used before but generally better than others I have used in the past. Occasional wearer, maybe once a week for half a day (cricket and golf) I find these very comfortable with no irritation or soreness unlike other types I have tried. Does what I need. Occasionally there''s a damaged one but that''s the same from any supplier. Much more comfortable to wear than my previous lenses. Excellent product. I’ve been using them for over a year we zero discomfort or problem. I have worn contact lenses for years and contact lenses have changed so much over that period. Now these Oasys lenses are the best I have had. So comfortable and are the best for dry eyes. Other lenses for dry eyes may be cheaper but these are the best and I will not compromise my sight. Great contacts. Such a difference from my last ones don''t feel i need to take them our or use eye drops all the time. I thought it was just my eyes that didn''t agree with contacts, but these are much more comfortable and I don''t get dry or irritated eyes throughout the day. I wear them all day without any discomfort. I bought these for my son who says the Hydraluxe are great, more comfortable and longer wearing than the previous Acuvue lenses. The Price is competitive and delivery is always fantastic, often next day. Wow! Placed my very first order with Feel Good Contacts who I just happened to find through a web search and so glad I did because what a fantastic service. Thank you for an extremely easy and efficient transaction - will definately be using you for my future orders. Really comfortable lenses. Tried wearing cheaper alternatives but keep coming back to these. I love these lenses, comfortable to wear all day and don''t fog up. Whilst, they are expensive, these are the best price I have found. I have bought my lenses from here for the last few years and always been pleased with the products and service. Very good contact, can wear all day with out problems. Best contacts I’ve used. I worked long hours in air conditioned environments and the contacts are ideal. Would definitely recommend. The most comfortable lenses I’ve had. Excellent product. Best contact lenses I have had so far. As i have dry eyes these contact lenses are very comfortable and i can keep them in for longer . I struggle with contact lense comfort and although i never find complete comfort these are the best by far and I''ve tried lots! Amazing product. I have been using it for almost a year and would say it is the best quality of contacts I ever worn. These lenses are great if you have dry eyes. They are so comfortable. I used to have a different brand but these are better although a little more expensive. Well worth the extra. I have swapped my Total Daily 1 day for the Acuvue Oasys and I am happy with the change. Excellent service. Speedy delivery. Will use again. Great contacts for dry eyes. I won’t use any others now I’ve found these. Much more comfortable than monthly lenses. Could forget to remove them! Worn lenses for over 40 years. Forget I''m wearing them, most comfortable ever. Speedy delivery, great service overall. The only contact lenses that don''t make me want to scratch my eyes out after a few hours. Best contact lenses I''ve worn. I suffer with dry eyes and these do not irritate my eyes at all. In fact they are the most comfortable lenses I''ve used and I''ve tried so many different brands over the last 20 years. Most comfortable lenses I''ve ever worn. Can wear them for 12 hours+ without dryness. Love these contact lenses and there price! I have really dry eyes and these are the best lenses I''ve found, after years of searching. Able to wear them for a full day with no discomfort. A bit more expensive but worth it! this is the first time I have used lady''s one day lenses and they are much clearer than previous one day lenses and of coarse more healthy for the eye and in my case with only one eye that is critical. Only been using a few weeks I changed to these as I have recently got a Dry Eye problem my previous lenses were making it worse my Optician recommended these lenses as the best for this problem and my eyes are much improved. Most comfortable dailies I have ever worn. Easy, quick, and the lenses come with a little pack of Haribo! These are the best contact lenses I''ve ever tried - so invisible and light you really don''t know you''re wearing them. Eyes feel less tired at the end of the day They really are amazing! I was hoping that this would be a cheaper alternative to Dailies total one. They are comfortable but feel a bit dry by then end of the day and if you get any eye makeup on them whatsoever it doesn''t wash off easily. Any makeup/dust/pollen tends to stick to the lens. So I''m going to have to fork out for dailies total 1 until I find a healer option! I purchased these contact lenses for my daughter and she is very pleased with them. Very prompt and efficient service. Contacts arrived as promised, when promised. No hassle. Lovely lenses. So comfortable. Thanks. Very comfortable lenses. Better than the normal ones I used to use. These are the most comfortable lenses I''ve ever worn. I used to suffer from dry eyes almost immediately after putting lenses in, but I can wear these all day and I don''t even notice them. 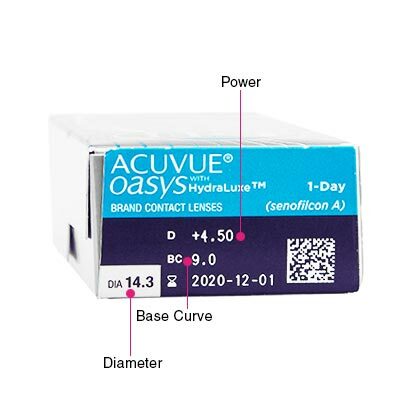 The Acuvue Oasys 1-Day lenses with HydraLuxe are the most comfortable that I have used in 50 years of wearing contact lenses. Great lenses. Good for dry eyes. I forget that I''m even wearing the lenses. I have dry eyes and these are the most comfortable lenses I have used. The best lens for me you can use it every day for all the day. All good easy to wear as expected. Comfortable and able to wear these lenses slightly longer than my old ones. The only contact lenses I can wear all day comfortably with my very dry eyes. Would highly recommend. Most comfortable lenses I have ever worn. Great for dry and sensitive eyes. Soft and doesn''t dry out; doesn''t irritate your eye. Best contact lenses yet! I have been using these lenses for about a year and they are terrific. As a sufferer of dry eye syndrome, these lenses don''t dry my eyes, very comfortable. Great lenses - very flexible and easy to put in, extremely comfortable to wear all day, the best daily lenses! Only gave 4 stars as they are quite expensive... but the product itself is top quality! First tiem I tried these lenses. I was really happy with the comfort straight away. These dailies are a bit more sturdy than standard Acuvue - much easier to put in and more durable/less sensitive to rubbing of the eyes. Try them! Perfect lenses, perfect fit. 5* service. Best lenses for dry eyes!!! My eyes dry very easily and I''ve tried many lenses. This is the best so far. I have changed to those from another brand which corrected my astigmatism, and I much prefer this one even though it doesn''t have the correction. They feel much more comfortable. Product is Amazing very very comfortable would highly recommend, I have especially dry eyes and these are the only contacts that I can wear all day now without my eyes getting itchy and sore perfect. Wouldn''t go back to anything else.. Product perfect; no other words required! First time user of these lens, feel very comfortable and last all day with little discomfort, highly recommended. Good. Wish came in 6 pack box tho.